A J-15 lands on the Chinese aircraft carrier Liaoning, carrying a YJ-83K anti-ship missile. Inset: The J-15T prototype attached with holding rods similar to Western EMAL systems. A recently released photo on the Chinese Internet has furthered speculation that the People’s Liberation Army Navy (PLAN) has begun trials of an electromagnetic (EM) catapult launch system, known as electromagnetic aircraft launching system (EMALS) in the West. It was previously rumored that China had successfully constructed its first EMALS in November 2016, but there were no official reports or pictures at the time. 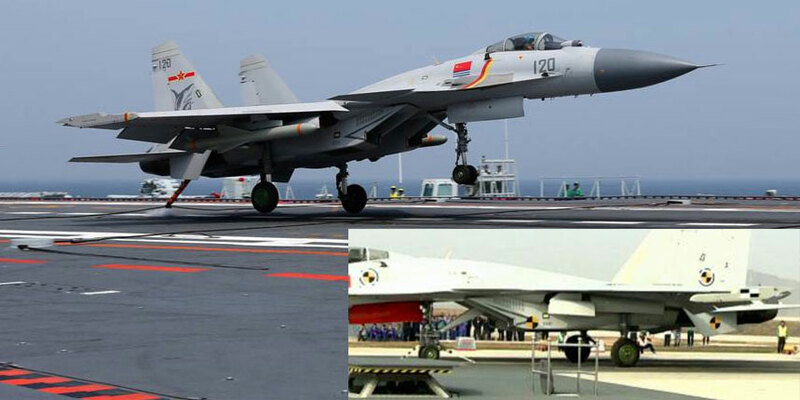 The photo shows a prototype Shenyang J-15T "Flying Shark" with nose gear designed for catapult-assisted takeoff but arrested recovery (CATOBAR) operations. The nose gear also features a front and rear holding rod that is similar to the American EMALS launch rail. The J-15 airframe is derived from Russia’s Sukhoi Su-33 carrier-borne fighter. Rear Admiral Ma Weiming, the PLAN’s propulsion and power specialist, said in a university seminar that he is confident that the EMALS will be installed on the “No. 3 carrier.” A Chinese analyst noted that this could refer to the third domestically built carrier, not including the Liaoning. Ma also said that the plan to build the No 3 carrier is delayed, since the PLAN is still evaluating both steam and EM catapults. He said that the EMALS is more reliable, less complex and cheaper than the steam catapult and the decision will come in a matter of weeks. China has already built facilities to test both conventional steam CATOBAR and EM launch systems. Satellite photos of Huangdichun airbase show an EM launch rail parallel to the steam rail. Professor Wang Qun, an analyst at the National Security and Military Strategy Research Center, noted that using EMALS on a conventionally powered carrier will consume additional fuel and energy and hence compromise the ship’s combat effectiveness. Concurrently, Chinese state media has released footage of J-15s conducting numerous sorties on the Liaoning, some of them carrying the YJ-83K anti-ship missile. The carrier group turns towards the South China Sea, where China is asserting its claim of control. According to the Pentagon’s latest report on Chinese military power, the Liaoning task group conducted a second round of integration training there last December.